A few weeks ago I did an engagement shoot in Bergen with Sheryl and Andy. I love travelling to different locations for pre wedding photography shoots. And while I did an engagement shoot in Paris this was my first in Norway. We took the funicular railway in to the mountains above Bergen for a walk around in the sun. Before heading down for a quick outfit change, some food, and a stroll around the streets of Bergen. I have been to Norway before and it is quickly becoming one of my favourite european countries. Bergen was really beautiful and we got SO lucky with the weather. Unseasonably warm – people were swimming in the lakes in the mountains and having picnics in the sun. Carrying a heavy camera bag around in the sun took its tole but it was completely worth it! But hey, I think I was the lucky on as I didn’t have to wear a suit! I really enjoy asian pre wedding shoots. I’ve been lucky enough to have more than my fair share this month. It’s a great chance to be creative and travel to new places. I love trying new ideas and create beautiful photographs and destination weddings really help inspire the mind. With new sights, smells and tastes (!) it’s impossible not to be inspired. Andy and Sheryl looked incredible. I’ll be showing you more images of them soon in a shoot we did back home in London with two more amazing outfits. I can’t stress how helpful it was to have beautiful sun from morning to evening. The next day was SO foggy. You literally couldn’t see the mountains that surround Bergen on one side. It would have made the photos very different – much more surreal – but the rain may not have helped! Anyway, thank you SO much Andy and Sheryl. Thanks for bringing your best modelling skills and being excellent company. Wow, gorgeous imagery. 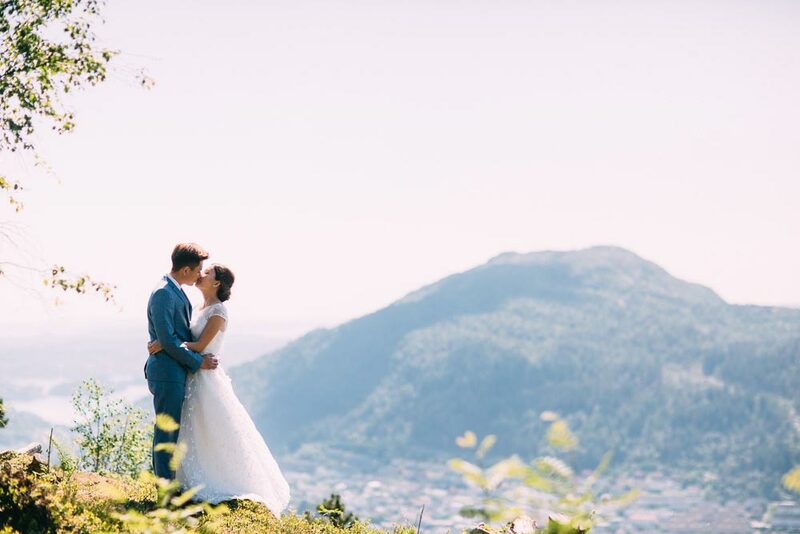 They are so in love and that location is just *swoon*! Beautiful engagement work! Love the tones and light! Norway is beautiful and what you captured with these pre-wedding/engagement images is nothing short of magical! Love this! The scenery is amazing.. <3 Congrats on having so wonderful photos!